Love triangles. I want to talk with you today about love triangles. You know what I am talking about right? You’ve seen the pictures and headlines on the tabloids in the grocery store check out lines. Love triangles are often the subject of movie plots and sometimes they are the circumstances in which a crime is committed. They are also a part of our lives. The question isn’t whether we are in a love triangle. We are, probably several. The real question is one of priority, commitment, and loyalty. In the classic love triangle there are three people. One is stuck between two love interests. The two love interests, knowingly or unknowingly, are competing with each other and vying for the time, attention, energy, and love of the third person. In today’s gospel (Matthew 10:24-39, Proper 7A) Jesus holds before us a couple of love triangles. “Whoever loves father or mother more than me is not worthy of me; and whoever loves son or daughter more than me is not worthy of me.” In the first triangle there is Jesus, us, and our mother and father. In the second triangle there is Jesus, us, and our children. These are by no means the only love triangles of our lives. Love triangles can involve anyone or anything. Every love triangle confronts us with two questions. What is your most important relationship? Whom do you love the most? After hearing Jesus’ words it’s not hard to figure out the right answer. The right answer is Jesus, but what is our lived answer? I would like to think that my lived answer is Jesus. I would like to say with confidence that Jesus is my most important relationship, that he is the one I love most. 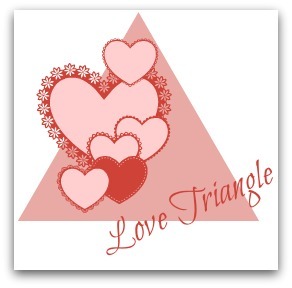 Love triangles are places of struggle and conflict. Regardless of what I would like to think or say, what does the evidence of my life show? What about the ring on my hand and the vows I made to Cyndy? Do I choose Jesus over Cyndy? How can I do that? As hard as it may be that’s what Jesus said I must do. According to my calendar this parish is my most important relationship. That’s where I spend more time than anywhere else. The parish and Jesus, however, are not necessarily the same thing. If you knew the thoughts that fill my head and some of the choices I’ve made you might conclude that I love myself more than anyone else. I’ll bet you know what I’m talking about. We’re probably not that different. Our lived answer reveals many different love interests. If, however, Jesus asks us to love him more than our own parents and children, our own flesh and blood, then he also does so with everything else about our lives. There can be only one primary relationship in our lives and Jesus says it is to be him. His demand for primacy is not limited to our mother and father or our son and daughter. It’s a primacy over everyone and everything in our life. He could have easily continued the list. Whoever loves friend more than me is not worthy of me. Whoever loves work more than me is not worthy of me. Whoever loves power, reputation, or wealth more than me is not worthy of me. Whoever loves country and flag more than me is not worthy of me. Whoever loves politics, agendas, or ideology more than me is not worthy of me. Whoever loves church, denomination, beliefs and practices more than me is not worthy of me. Whoever loves self more than me is not worthy of me. Whoever loves anyone or anything more than me is not worthy of me. So tell me, what are the love triangles in your life? What is your most important relationship? Whom do you love the most? Today’s gospel holds before us and confronts us with the many love triangles in which we all live and struggle. It demands we make a choice. Does that mean we must reject our parents, our children, our spouses, and all other love interests? No, that’s not what Jesus is saying or asking. Jesus is not demanding exclusivity but he is demanding priority. Jesus refuses to be just another one of our many love interests. Jesus’ refusal to be just another love interest, his demand for priority, is for our own good as well as the good of our love interests. We can only ever have one primary relationship. That one relationship gives us identity and our lives meaning and direction. It becomes the lens through which we see the world, each other, and ourselves. It is the foundation on which we build our lives. It guides the choices we make, the words we say, and the ways in which we act and relate. It sets a trajectory for our lives and determines how we love. Why then would we want it to be something or someone other than Jesus, God embodied in human life, flesh, and blood? I know a woman who figured that out and I will never forget what she said. One day she told her husband, “When you love God most you love me best.” There is great wisdom in what she said. It breaks the triangle. No one is left out, excluded, or rejected. God, not ourselves, becomes the source and origin of our love. This is the love by which we take up our cross and follow Jesus, the same love with which Jesus loves us. I want to love my wife best. I want to love my sons best. I want to love my parents best. I want to love you best. I think we all want to love as best we can. We do that only when we choose Jesus first. We love each other best when we love God most. The wife’s comment, “When you love God most you love me best,” offers a valid solution to the perennial issue of how to balance the loves of our lives. Your contrast between the “right answer” and the “lived answer” hits home. I think of how handily we sing the recurring refrain in the hymn, “My Jesus, I Love Thee”: “If ever I loved Thee, my Jesus, tis now.” That’s the “right answer,” but . . . When I went to the link to the lectionary, the Genesis triangle involving Abraham, Sarah, and Hagar jumped out at me. How often do we, like Father Abraham, craft our own solutions to problems that seem to have no answer? Again, the “right answer” contrasts or conflicts with the “lived answer.” Thank you. Lawrence, seems I am always trying to close the gap between the right answer and the lived answer. Just a thought, though. I feel that we fail to feel God (God’s love, compassion, protection etc), but try to visualise Him instead, make Him one of us, flesh and blood, our next door neighbour aso.. And that’s why we may think we betray our loved ones by loving God first and foremost For me, loving God is trying to become what God wants me to be. And I feel more lovable every time I achieve that. What goes around comes around. Thank you Estera. I’m always appreciative of your insights. Maybe instead of making him one of us he makes us one of him. Have you been reading Dostoevsky, Father? Almost all of his major novels feature a love triangle. Usually it’s a man between the quiet, prayerful good woman and the half-Saint/half-whore who is teetering on a precipice of either redemption or destruction. Andrew, I’ve not been reading Dostoevsky though I must admit that the Brothers Karamazov has been waiting on my bedside table far too long. Thanks for the encouragement to pick it up. I have struggling with which dreams/visions to share and the lessons I have learned, and I pray often to Jesus as to which lessons He wants me to share. Today I read this sermon and want to include some extra verses in my own post. Matthew 10:22-39. It not only answered my prayer as to what to share (everything I learn or Hear that could help someone else), but also where our priority in life should be: Please read this article. This particular dream I had was from 11-6 (night) and 11-7 morning. I will include more as meanings become more clear. Thank you Paul. I hope the analogy was helpful for your congregation. You’ve pointed out, and rightly so, a limitation on the analogy and I appreciate your insight. To live in triangulation is difficult, painful, and often destructive to others and ourselves.